The Chaos Has Ended. You Will Be Remembered. This is another piece for Legendary Realms Terrain. 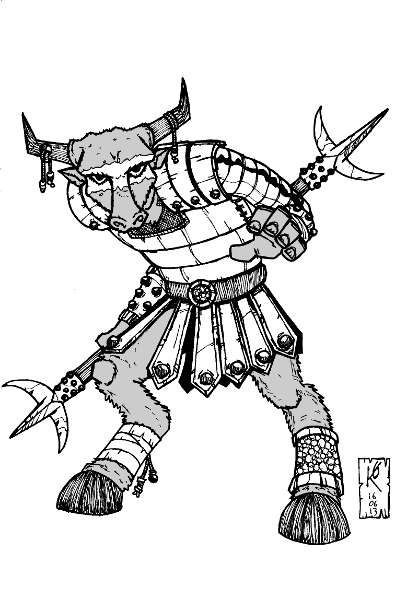 When one sees a minotaur in fantasy art -- in particular Dungeons & Dragons-related art -- they tend to be bulky bruiser types. I've tried to go for something a bit more athletic here. It is safe to say that I was somewhat excited. Rumours have been circulating of late -- as they often do -- that GW are going to release a limited edition game this year and that said game would be either Blood Bowl or Warhammer Quest. While I love Blood Bowl to bits I already own two sets, but I never got to own Warhammer Quest, so when I saw the logo on the site I was about ready to pay right then and there. Alas, there is no deluxe big boxed set on the way -- yet -- but there is an iPad version. I suspect that this means that there won't be a tabletop release on the way after all. Godzilla plus Dragonball Z plus Lord of the Rings plus the crappy Transformers, not as good as the first three but better than the latter.